Okay, I’ve been terrible with posting my favorite recipes lately! I have so many that I need to catch up on share with you guys!! When I made this – I couldn’t get enough. I rarely take credit for coming up with these things on my own. I usually do a search for something I’ve got a hankering for or I check one of my favorite blogs and then make a couple of changes to make it a bit more of my own. Everything I try off of this blog is outstanding!! I found this one on one of my favorite blogs – Love and Lemons, and made just a few changes. The yogurt sauce is out of this world!! Save the leftovers of the yogurt sauce and use it on other things, because trust me – you’re gonna want to. This is also a great way to sneak in some veggies into taco night!! Toss sweet potato cubes with oil, chile powder salt & pepper, and spread in one layer on a baking sheet. Bake for 20 minutes, or until golden brown. Remove sweet potatoes from the oven and set aside. Throw in the corn and black beans over low to medium heat to cook through. You can also place these in a microwave safe container and heat up a little. In a small food processor, blend together the yogurt, avocado, garlic, lime juice. Blend until smooth. Taste and adjust seasonings. 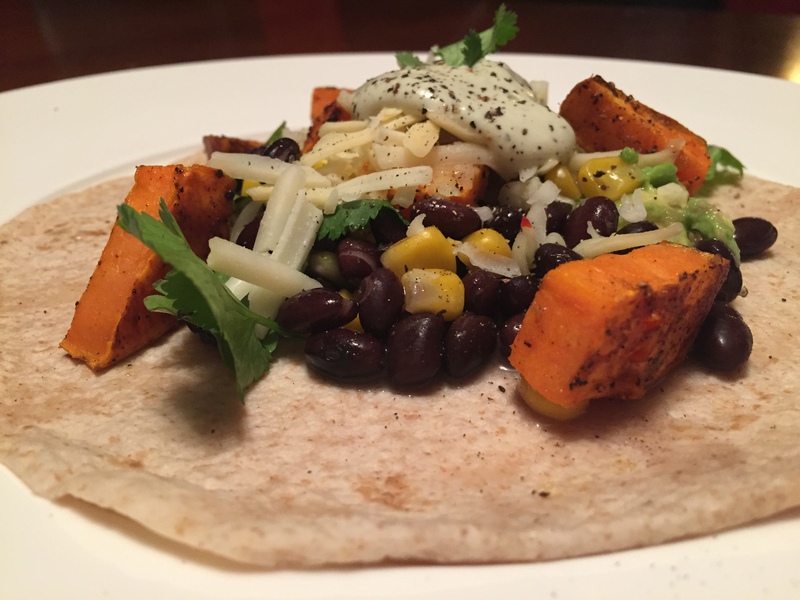 Assemble tacos with roasted sweet potatoes, diced avocado, black beans, scallions and cheese. Serve with avocado yogurt sauce.